We offer Grades AISI 304 or 316L stainless steel floor and trench drains with high corrosion resistance; ideal for pharmaceutical, chemical and petrochemical industry applications. Contact us today! (520) 421-9988. ACO's stainless steel drainage systems dispose of water and grease effectively and immediately. Contact us today! (520) 421-9988. ACO's building drainage solutions take into consideration food safety, cost control and health & safety. Our stainless steel floor and trench drains will amaze you. Contact us today! (520) 421-9988. ACO offers sustainable, integrated drainage systems designed to protect your business and the environment. Our aim is to constantly improve every aspect of safety, delivering a hygienic and functional performance system that can even be water proof. We believe our systems and services are truly unique and deliver unparalleled benefit to everyone involved in project delivery and of subsequent operation. Many of our stainless steel drainage products in the Building Drainage division are floor and trench systems designed to be the ultimate in hygienic performance solutions, ensuring the health and safety of workers, customers and products, while still allowing clean-in-place functionality. Contact us today! (520) 421-9988. Thank you for joining us for our ACO Building Drainage team webinar "Protect Your Customers and Your Brand by Preventing Food Contamination"! If you missed the live webinar, you can watch the recording. Join us at our tradeshows to talk to our experts and see our latest products! Our impressive portfolio of projects suit different needs, take a look at our ACO Building Drainage Case Studies. View more Case Studies related to our other Brands and Solutions for Drain. Quartz ACO ShowerDrain channels offer a more artistic solution to shower drainage. There are 7 grate styles available in stainless steel or oil-rubbed bronze to complement other bathroom fixtures. Point drains also available in 5 grate styles, including tile inlay. Let us help you find the perfect solution to your bathroom needs. 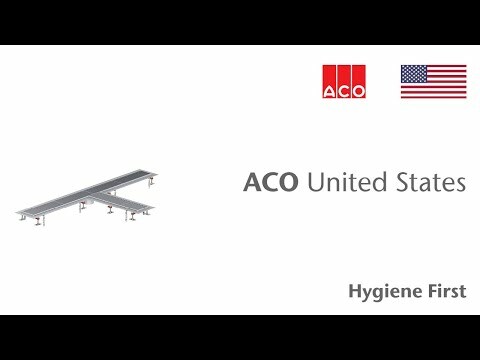 We at ACO are committed to ultimate hygienic performance. We believe drainage matters and can play critical role in overall food safety.